Rajasthan Royals 7-165 (Rahul Dravid 65, Stuart Binny 40, Umesh Yadav 4-24) beat Delhi Daredevils 6-160 (David Warner 77, Unmukt Chand 23, Kevon Cooper 3-30) by five runs. Rajasthan Royals hammered 165 for the loss of seven wickets in the measured 20 overs and Delhi Daredevils managed 160 with four wickets in hand. Rahul Dravid (Rajasthan Royals) was declared ‘Player of the match’ for his breezy innings of 65 off just 51 balls. The fourth match of the Indian Premier League was played on Saturday, April 6, 2013, at Feroz Shah Kotla, Delhi. Earlier, Rajasthan Royals won the toss and preferred to bat on a good looking strip whereas their innings was opened by Kusal Perera along with Ajinkya Rahane. The latter was dropped on the second ball of the third over at five and hit a couple of fours before he was gone for 14. Rahul Dravid replaced him and opened his account with a boundary while Rahane was creeping at his end and opened up in the 9th over with 2 fours. The pair took the score to 87 in 11.3 overs when Ajinkya Rahane was caught and bowled by Shahbaz Nadeem for 28 off 24 balls with 3 fours. Stuart Binny walked in next as Dravid was dropped at 38 by Andre Russel at his own bowling on the first delivery of the 13th over. Binny hit 3 sixes and 2 fours in the next two overs but was clean bowled by Umesh Yadav for 40 from 20 mere balls comprising 3 lofty sixes and 2 fours. Rahul Dravid compiled his fifty in between and became the next victim at 161 after contributing 65 valuable runs with 2 grand sixes and 6 fours. Rajasthan Royals reached 165 with three wickets remaining at the close of the 20th over. Umesh Yadav was the star performer by grabbing four wickets, Ashish Nehra held two whereas Shahbaz Nadeem got one wicket. Delhi Daredevils started off reasonably well with their openers David Warner and Unmukt Chand who scored 22 runs in the first three overs. Warner got a life at two when he was let off by Dravid at backward point at the bowling of Sreesanth in the fourth over and availed the chance by adding two consecutive fours in the following one. The first wicket produced 39 runs in 5.4 overs as the stumps of Chand were dislodged by Sreesanth for 23. The captain of Delhi Daredevils, Mahela Jayawardene, joined in next with Warner and they accumulated a score of 43 with a few boundaries as the first was caught superbly by Rahane at point off Rahul Shukla for 19 at the total of 82 runs. Manprit Juneja associated with Warner who reached his fifty in the 14th over with a four and was dropped again at 57 in the next one. The duo raised the run rate by hitting 2 sixes and 1 four as Juneja lost his wicket for 20 in the 18th over. David Warner followed him in the next over when he was run out for 77 scored from just 56 with 1 six and 9 fours. Delhi Daredevils required nine runs to win the game in the last six balls as Kevon Cooper grasped two wickets and gave away just three runs. 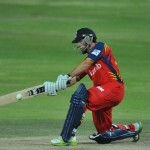 Delhi Daredevils scored 160 runs for the loss of six wickets at the end of the 20th over. Kevon Cooper impressed by taking three important wickets whereas Sreesanth and Rahul Shukla shared one wicket each. Rajasthan Royals clinched the interesting encounter by a margin of five runs and earned two points by defeating Delhi Daredevils.